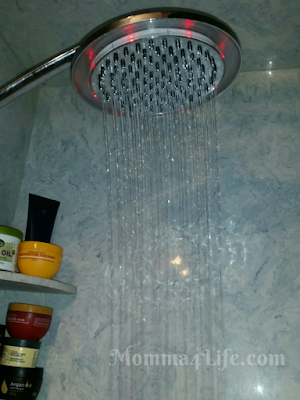 I am really excited to tell you about this hotel spa shower head this shower head it is amazing. 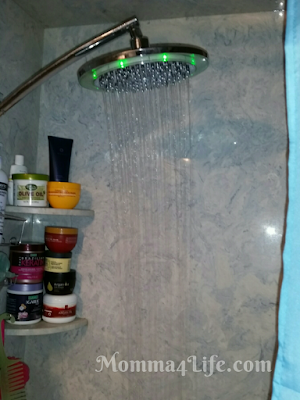 It has LED lights to let you know the temperature of the water which is really nice if you want the water just right. I don't do a lot of showers I take mostly baths but my husband and my daughter absolutely love taking a shower. So obviously when the light is blue that means the water is too cold and under 95°F temperature. And when the light is green that means it is just right and the temperature is around 95° to 108 Fahrenheit. And finally when the light is red it means the water is too hot and that temperature is 109 to 122°F. My husband just sits in the shower and lets the water fall on him he loves it. 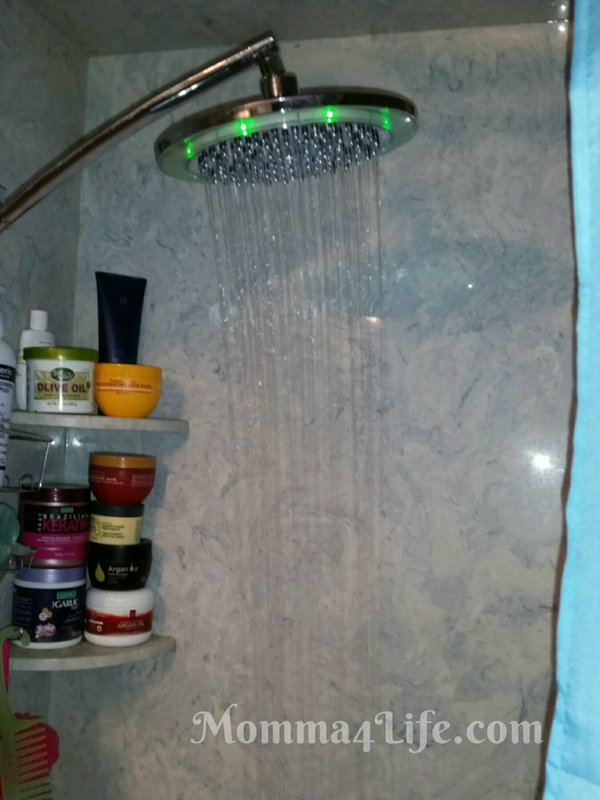 These LED lights are powered by the running water no batteries needed it has a giant 10 inch LED rainfall shower head. The arch design is made of stainless steel the height can be adjustable with the extension it has a 15 inch arm. These led lights have a long life of 100,000 hours that's over a ten-year span of heavy use. This is a cool shower head never seen one like this before. This comes with a one-year warranty he and would be the perfect holiday gift for someone that likes to pamper themselves. 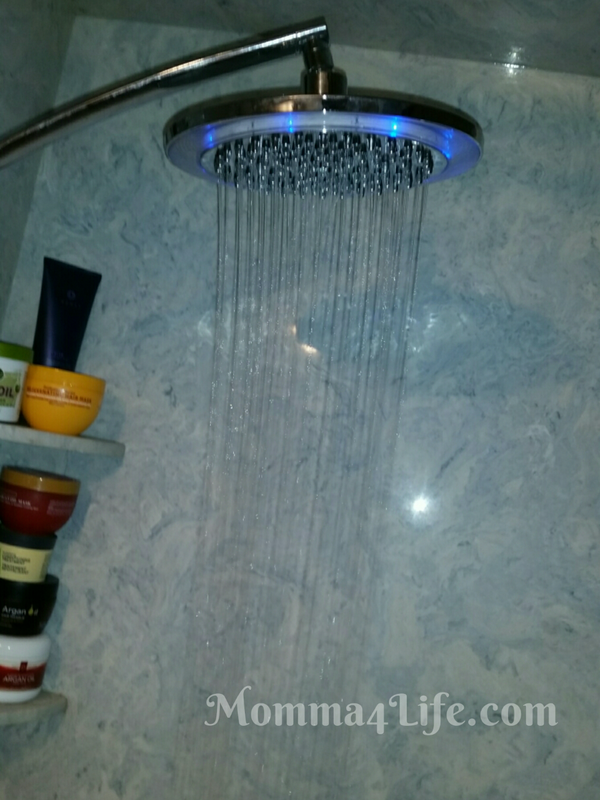 If you know someone who likes to take showers and could benefit from this shower head make sure you check it out I will leave the link in this post. And then finally this is what it looks like when it's to hot and then you know you shouldn't get in yet. 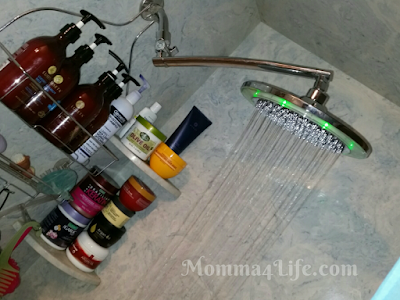 Upgrade Your Bathroom with PlumbTile! Doc McStuffins: Pet Vet on DVD Out Now!! Inside Out on Dvd Review Out on Dvd Now! !